Dogged by depression, doubt, and - as a trip to the Mayo Clinic has revealed - emphysema, 66-year-old Sherlock Holmes is preparing to return to England when he receives a shock: a note slipped under his hotel room door, from a vicious murderer he'd nearly captured in Munich in 1892. The murderer, known as the Monster of Munich, announces that he has relocated to Eisendorf, a tiny village near the Mayo Clinic in Rochester, Minnesota. 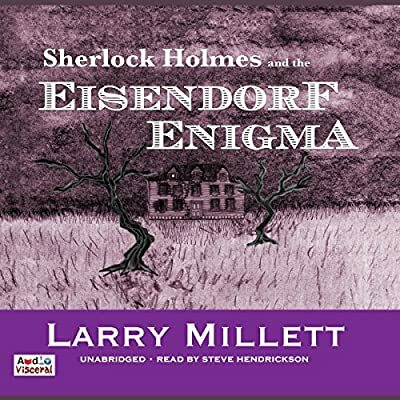 If Holmes is not what he once was, the same can be said for Eisendorf: once a thriving community founded by German idealists but now a dying town with only 40 residents - two of whom have, indeed, died recently under highly mysterious circumstances. Replete with all the Gothic richness of Larry Millett's earlier Holmes novels, Sherlock Holmes and the Eisendorf Enigma links events in 1892 Germany with those in small-town Minnesota in 1920 in a double mystery that tests the aging detective's mettle - and the listener's nerve - as never before. Guided by Eisendorf's peculiar archivist and taunted by the Monster, Holmes finds himself drawn into the town's dark history of violence and secrecy and into the strange tunnels that underscore the old flour mill where answers and grievous danger lie in wait. No longer the cool, flawless logician of times past, Holmes must nonetheless match wits with a fiendish opponent who taunts him right up to an explosive final confrontation.